The movie fails because the initially strong premise quickly falls into fight scene after fight scene, with each fight getting progressively larger, until the inevitable final confrontation cliche of just about every superhero movie ever. If this was a live action movie it would fit right into the Joel Schumacher era of Batman films. Amazing production design, lots of action and spectacle, on top of very shallow storytelling. Obviously the version I watched was the English voice cast, who all do a great job in their roles, though Tony Hale's Joker laugh really started to grate after a while. Not to say that his laugh wasn't good, there was just too much Joker in this film (you wouldn't think that would be a bad thing). It felt like he had nearly as much screen time as Batman. Aside from that I'd definitely welcome a better written, anime inspired, Batman movie with this voice cast. This movie could have been so much better if it had utilised the consequences of time travel in a more meaningful way, or had given Batman the challenge of doing detective work without his gadgets. It tried to play around with Japanese history but didn't really flesh out that idea to any meaningful consequence. 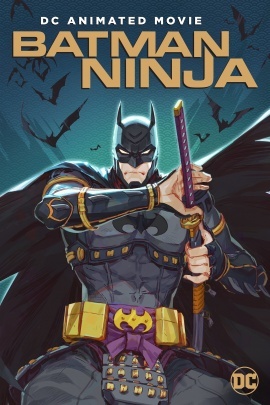 Batman Ninja is worth watching once for the artwork, animation, and voice cast but, unless you're into seeing Batman get into a series of fights and not do too much else, it's not a film you'll be in a hurry to rewatch (though I hear the Japanese language version is a completely different script but with the same visuals... hopefully it's a better story - Read the article on Gamespot).